I don’t know why but I was getting ready to write this review for so long that I’ve almost used half of the container of this oil. My skin is of combination type. It’s thin and tends to be oily in summer and dehydrated in winter. Sometimes my skin breaks out making my pores clogged. Earlier I’ve never used any facial oils. 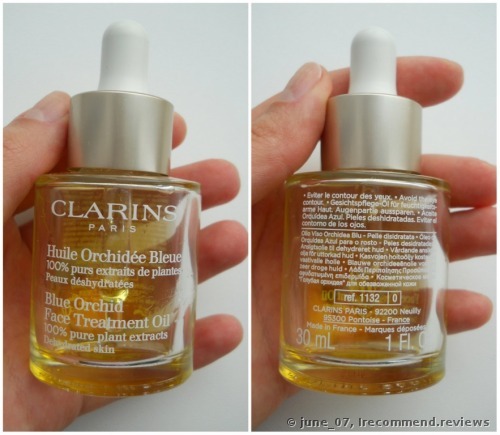 Until recently I read so many positive reviews of Clarins oil and decided to give it a go. I opted for the Orchid version as I desperately need moisture from this product. I’ve been using this oil for a month already and now I can share my opinion about it with you. I use it a lot and I use it often. Sometimes I count the drops I pour on my face and once I was stunned when I understood that in a pursuit of a better effect I poured out 8 drops! That’s why I couldn’t understand why they wrote that the product lasts them two years. Moisture care for Dehydrated Skin. 100% pure plant extracts with no preservatives. 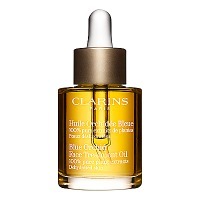 This best-selling oil contains extracts of Rosewood, Patchouli and Blue Orchid to tone, revitalise and restore radiance to moisture-depleted skin. Hazelnut Oil helps prevent moisture loss and the formation of fine lines. The glass container is 30ml with a glass drop dispenser. This one’s great as it gives out the small right sized drops. The oil is better to store in a dark place since the oils can lose their wholesome properties and go rotten. The product looks yellow in the container but on my face it's transparent. The product has its characteristic smell. I don’t like it much and I believe that the Lotus version is better scented. I have no idea how patchouli smells but I presume that it gives the product such a strange smell. It isn’t floral, for me it smells like herbs and spices. At first I felt sick from this aroma but after a few uses I completely fell in love with it. I take the process of oil application as aromatherapy now which really relaxes me. I can recollect that when I had already bought this oil, I was looking through the reviews where one girl said that its consistency was reminiscent of olive oil. Honestly guys if I had read it before the purchase I would have never bought the product. I can’t imagine this thick olive oil’s consistency on my combination skin, let alone leaving it there overnight! I could already imagine that I wake up in the morning and my face is shining bright like a diamond. 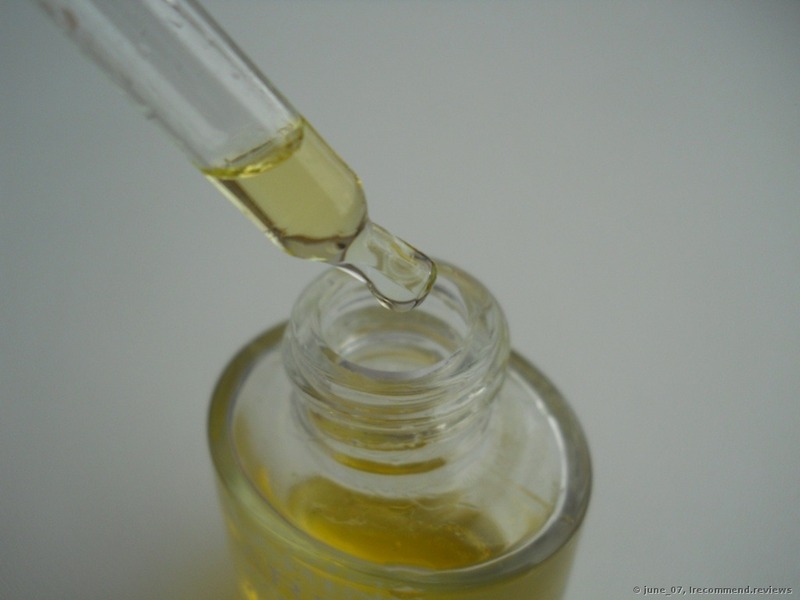 When I opened my oil I was so happy to find out that its consistency had absolutely nothing to do with olive oil! I can’t even place it in line with other oils that I know: coconut or almond for example. Nothing in common! The Clarins product is lightweight. It’s liquid and less greasy than any other that I’ve faced in my life. Plus it isn’t thick at all! This face oil isn’t the first that I’ve tried and I can assure you that the Clarins one is the lightest ever! Yet it isn’t dry. Ohh, so difficult to describe. 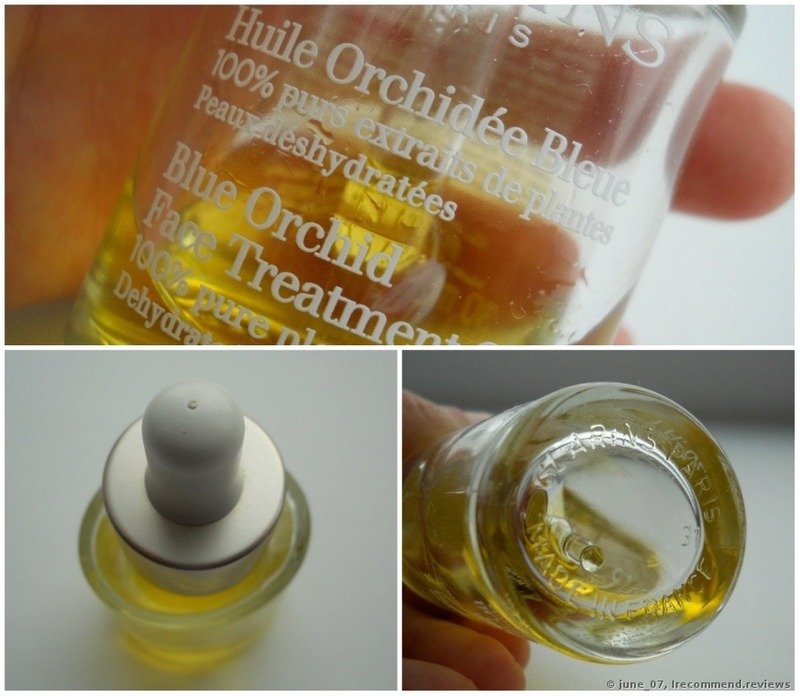 The Orchid oil version is runny, light, not thick, heavy or greasy. This is my own explanation, this is the way I feel it. I also didn’t know how to swatch the oil right to show you the maximum of its consistency and formula. In the end I decided to add a drop of a peach oil for a comparison. The Clarins drop is on the left and peach oil is on the right. 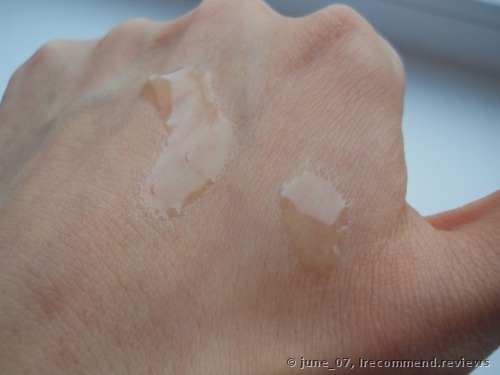 The Clarins drop is runnier and drips down my hand while peach oil stays in place. I’ve tried several ways of application of this product. First of all I tried to apply the product on my cleansed face. Then I tried to apply it on my wet face. Then on my toned face. And after all of these experiments I can say that way of mixing the oil with my face lotion and massaging that consistency into my skin turned out to be the best of all. That way the oil was best absorbed and it had never weighed down my skin. If I felt that I overdid with the amount of drops and applied too much, then I just took my toner and a cotton pad and wiped away all the unnecessary residue. Or sometimes I just poured some drops of the toner in my hands, rub them well and also took off the excess amount. It directly depends on the needs of your skin and applied amount of the product. 2-3 drops of the oil mixed with my facial lotion sink in very quickly. No weighing down, no greasiness or oily film. No nothing. I don’t even have a desire to wash my face after this oil application. The product is totally comfortable. As I’ve already told you that I even used to pour out up to 8 drops at once, but I can’t say that the result was any better. It took a longer time to sink in and that’s all. So, don’t overdo with this product. As for my night cream application or any other moisturizing stuff, I had no issues with them. I used to apply the cream when I needed and it was well absorbed and didn’t glide over my face. I could have never thought that it might be possible to apply a night cream after the facial oil! Here the product works as a serum providing a better absorption of good ingredients from the cream. I also noticed that my cream works way better if applied over this oil. So I have found my perfect winter skin care products, as for summer I think they may be too heavy. I wouldn’t say that I rave about this oil as many other girls do. My skin is soft and nourished after it’s applied and soaked, but there isn’t proper moisture. Even the cheapest night cream gave me better moisture than this oil. I think that the product isn’t aimed at moisture and if you are looking for a good hydration then you should opt for a serum, as it’ll work way better than this orchid product. In general I can say that in the morning my skin looks good: it’s fresh, even and elastic. The complexion is evened out and that’s all. I can’t say that I feel the result. My skin doesn't feel nourished and moisturized at all. When I wake up the first thing I really want to do is to apply a thick layer of any moisturizing cream on my thirsty skin. The oil doesn’t have any accumulative effect which means that my face looks good only in the morning if I applied the oil overnight. The product doesn’t affect the under eye skin either. It’s felt as though it neglects this face part and does no job here! That’s why I have to apply my eye cream even though I do apply the oil there too! My skin reacts well on this product and never breaks out. It also doesn’t affect the existing bumps. The product is non-comedogenic. 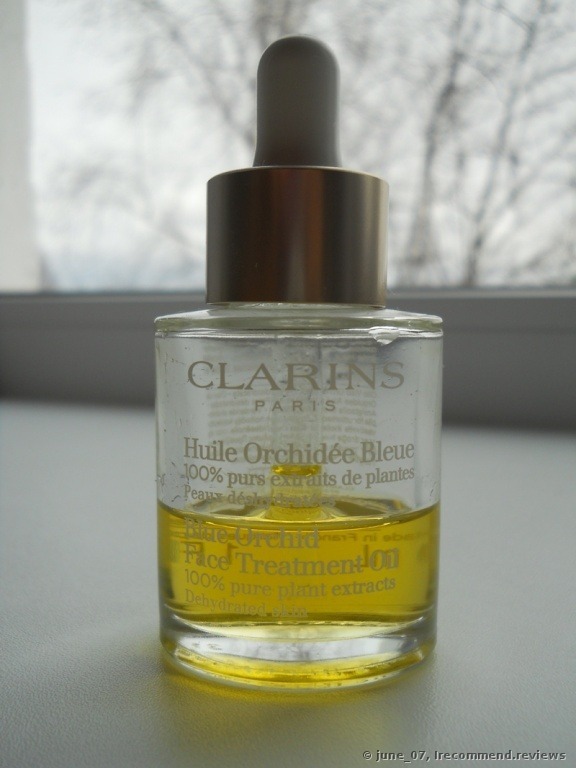 Only once when I used this oil with the Clarins Camomile Toning Lotion I received totally clogged pores and a lot of bumps. Thank God it happened only once. After that incident I changed the lotion and never faced that problem again. I didn’t get the desired effect after using this oil. I didn’t even get the minimum from it, even though I was using it frequently and a lot. using this oil enlarged my pores dramatically! I noticed it when I looked at before and after photo. On the left it’s before and on the right in the moment of constant use of the oil. FINAL THOUGHTS: I was expecting a good moisture and nourishing from this oil but I’ve never received that. It seems that the product works but if I think logically, no effects there. The only positive thing is that probably after using this oil I understood that in general oils are my cup of tea and I need to find mine. I liked that the oil is lightweight and fast to absorb. I also appreciate very much that there was no oil film on my skin which really makes this product stand out. So, I can’t say that the product is bad. It’s very controversial as I know that some people are allergic to it, while some see no effect. So I want to advise you to find a sachet and test it before buying the full size. Smart face oil? Formula, how to use and my results.